Backyard swing set disposal is a real challenge, nearly regardless of its condition. Since these play amenities are constructed with metal, wood, and plastic, all the materials must go to the proper destination. For instance, the metal and plastic might or might not be candidates for recycling — the same goes for the wood. But, since it’s so large and has various materials, you’ll need to schedule junk removal. This way, it’s all done for you so you don’t have to worry about what goes where. Not to mention the fact that if you don’t have a truck and/or trailer, that’s another factor that comes into play. Of course, you’ve got to take it apart first, which will require at least one set of helping hands and some common hand tools. Unfasten the play components. Next, unfasten the play components, including the swings, chains, slide, and so on. You’ll like need assistance with this stage so you can work with little interruption. 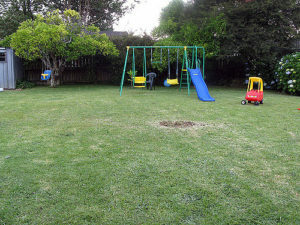 If you need help with kids’ play equipment removal and disposal, just phone 800-433-1094 or visit Junk Garbage Removal.